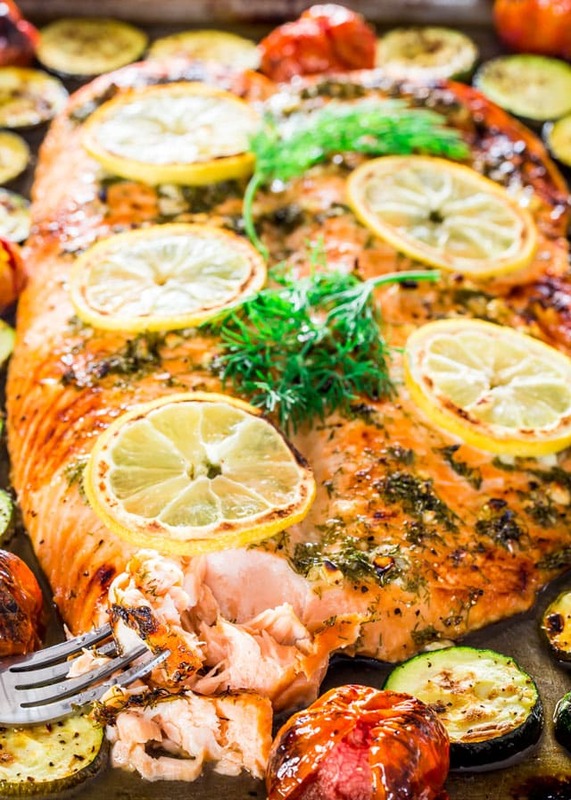 This Honey Garlic Salmon and Veggies Sheet Pan Dinner is about as easy as it gets to get dinner on the table in 30 minutes and the cleanup is a cinche! So I have another sheet pan dinner for you guys, and it’s simply because lately I’ve been making a lot of these, they’re just too darn easy. Plus I’m on a salmon kick lately, so salmon dinner it is. I bought a gorgeous piece of salmon from Costco and couldn’t wait to make it. I loved my firecracker baked shrimp so much, I just had to make more salmon again. This time, however, I tried to stick to my all time favorite way to eat salmon, with lots of dill, lemon, honey and garlic. And what a dinner it was. First off, the marinade or sauce, whatever you want to call, is so delicious and it’s made with honey, garlic, lemon, dill, salt and pepper. Mix it all together then pour and spread over the salmon on both sides. 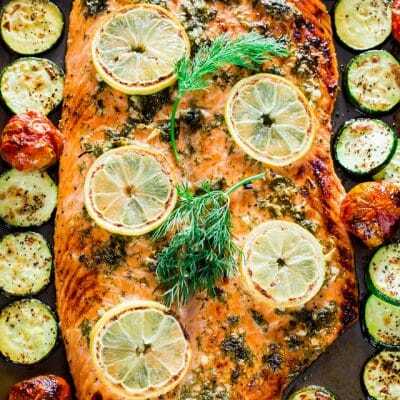 I didn’t add this to the veggies here because as this salmon bakes and those juices release in the pan, the zucchini and tomatoes soak up all those yummy juices thus flavoring them. I used zucchini here and some gorgeous cocktail tomatoes which we got at the farmer’s market, but broccoli would be a nice addition, or even some asparagus. I did, however, season the veggies with salt and pepper and drizzled a bit of olive oil over them. That’s about all there is to this dinner, about 10 minutes of prep time and 20 minutes bake time and you’ve got dinner in 30 minutes. I do like my salmon a bit golden brown, so for the last 5 minutes, I turned the broiler on and browned the top a bit, but if you don’t care for that, the fish will be ready after 15 minutes of baking. Try these other super easy sheet pan dinners! Preheat oven to 400 F degrees. Spray a large baking sheet with cooking spray and set aside. In a small bowl whisk together the honey, garlic, lemon juice, dill, and half the salt and pepper. Pour over the salmon and spread on both sides. Place the salmon in the middle of the baking sheet. 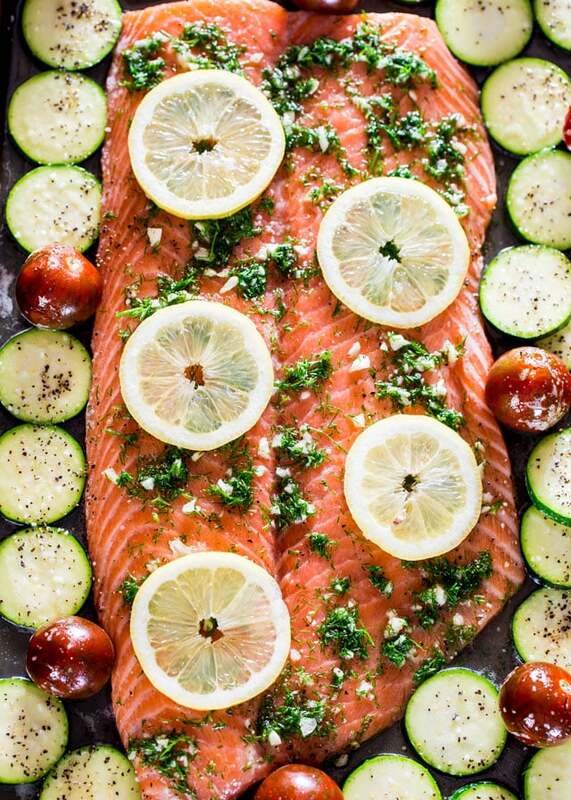 Place some lemon slices over the salmon, if preferred. 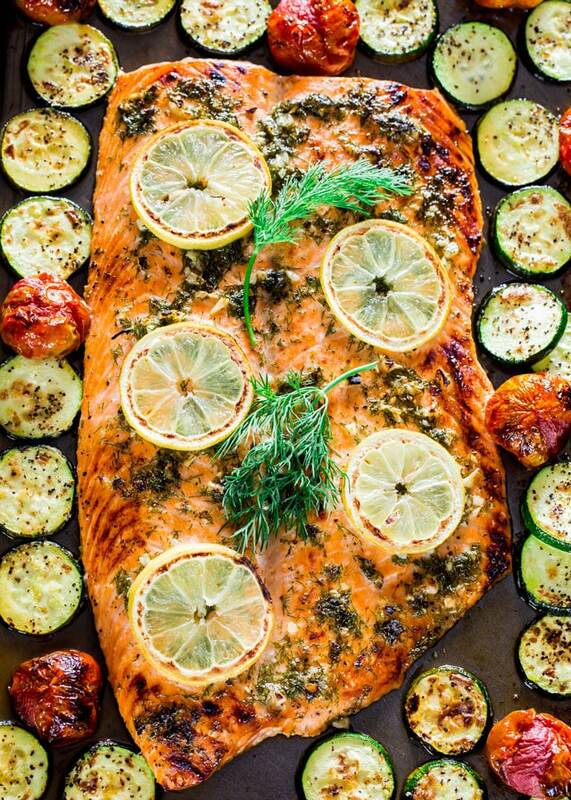 Season the zucchini and tomatoes with the remaining salt and pepper, then drizzle the olive oil over them and place in the sheet pan around the salmon. Place the sheet pan in the oven and bake for 15 minutes. Turn the broiler on and broil for another 3 to 5 minutes or just until the top browns a bit. Make sure you watch it often as it could burn quickly. If you don't like zucchini, you can use any type of vegetables that you like. For example, broccoli, cauliflower, Brussels sprouts, potatoes, etc. Great, easy recipes! I am impressed with all of them!